Radio Properties is an Authorized Kenwood Service Station. Our Technical Staff have decades of all brand Land Mobile Radio experience, which include service to all the popular radio names such as, Motorola, GE, Icom, Relm, Collins, Vertex-Standard, Neutec, Uniden and more. Each Technical Service Representative has a directly related formal education in electronics, supplemental to an extensive experience history. 1) Board level repair and alignment. 2) System Proof of Preformance. 3) Modifications and reverse engineering. 4) Firmware and software updates, Radio Programming. (which include Eprom and EEprom chip programming). 5) Complex Transmit and Receive antennna systems. (Duplexer*, Cavity, Hybrid, Combiner and filter alignment). 8) Part Sales. (We stock many hard to find parts). 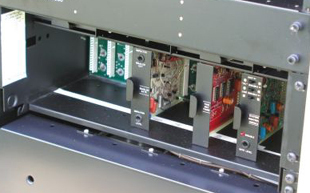 9) Amplifier Repair and construction (Specialists in Solid-State and Tube Amplifier repair & service.). 10) 24 Hour Emergency Service available. Skipp May: Sales and Technical Support.